Mr. Bingle ... every year the giant Mr. Bingle (a snow-boy with an ice cream coned head) covered the giant Maison Blanche store downtown. His theme song was: "Jingle, jangle, jingle here comes Mr. Bingle..."
Morgus the Magnificent ... he was the New Orleans version of Dr. Paul Bearer. His sidekick Chopsley was always messing up an experiment or two during the commercial breaks of The House of Shock Theater. Morning Call ... No Cafe Du Monde for the natives. 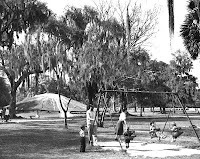 We all used to hang out at Morning Call (now relocated to Metairie) where the French Market is today for coffee and donuts (cafe au lait and beignets). The Raven ... best bar uptown with Percy the bartender and at least three good fights a night. F&M Patio ... we used to have parties there and actually (in high School) produced concert/dances at this dive with great acts like Willie Tee and Deacon John. It is STILL there and STILL a dive. Our "company" was called "Hammercheck Productions" ... it's a name derived from what every guy growing up does as a stupid trick to other guys. Whispers something in their ear while hitting them right between the legs. We called it hammercheck (bet you did it too). Fortier/ Warren Easton/ Newman/ Jesuit High School ... depending on your economic standing you would have gone to one of these or had lots of friends there. The last two are private. The Mannings went to Newman. Fortier was my school. There were two entrances ... the Nashville Avenue side (where you could only come and go if you were a "hood") and the Joseph Street side for everybody else. There were only two classes of kids there. If you chose Nashville and you were not a hood, you would be seriously killed. Sno Balls ... not the kind you throw ... these are the kind you eat. We used to get them at Rendon Inn but there were famous places across the city for these creamy ice sculpted syrup laced treats. The Blue Room ... at the Roosevelt Hotel was the nightclub for great entertainment. Perlis ... the only place to get really cool clothes. I got carried away .... sorry. I'll stop the trivia madness now. I love your blog and your homage to New Orleans. Having family in Bay St. Louis I spent many summers exploring New Orleans and you brought bake many fond memories. Camelia Grill - We have a picture of the Camelia Grill up on the wall bought in New Orleans about 18 years ago. The memory still makes me smile. Ponchatrain Beach ... My parents would take us here as a special treat when we visited the Gulf Coast. It was falling apart at the time and I thought I was going to die on the zephyr. Sno Balls ... I still crave these with cream topping (sweetened condensed milk for the rest of the world). When we lived in Boise I talked the local snow cone place into offering cream topping and it was such a hit they gave me free snow cones for life.